PURSUING EXCELLENCE: PURSUING EXCELLENCE IS ALMOST A PUNISHING VENTURE. Excellence is always difficult to achieve, but perhaps nowhere more so than in human relations: raising children, nurturing long-term partnerships, caring for elders, working through conflict, and having difficult conversations... No simple formula presents the pathway forward, which is discovered one increment at a time, like navigating in fog. The process can be unnerving, for reefs are usually hidden. But having a strategy or philosophy by which to navigate, and trying to stay consistent to it, despite fog, does yield results over time, sometimes long periods of time. Those results, patiently awaited, generate a glow of satisfaction, the reward of work well-done, a sense of approaching some sort of excellence. 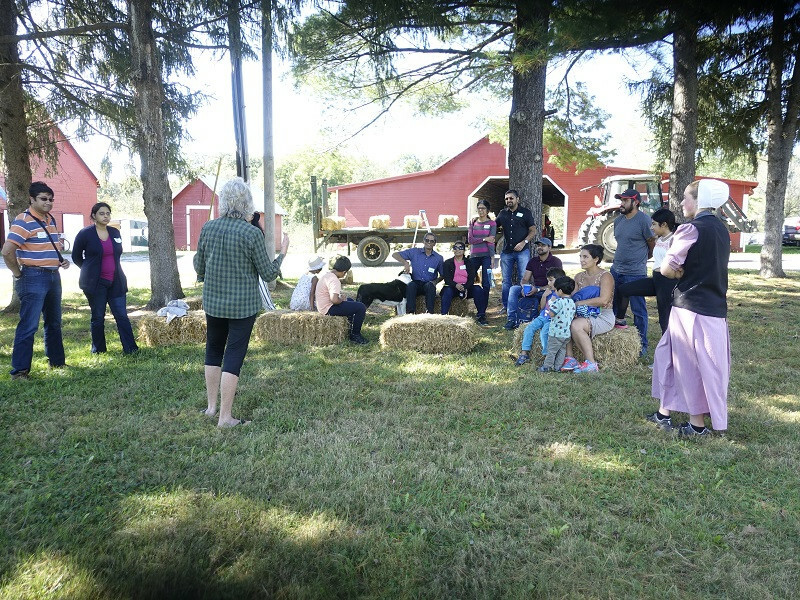 FOOD & POLITICS: OUR FARM TOUR LAST WEEKEND REVEALED A COLLECTION OF CULTURES CONVENING OVER FOOD. 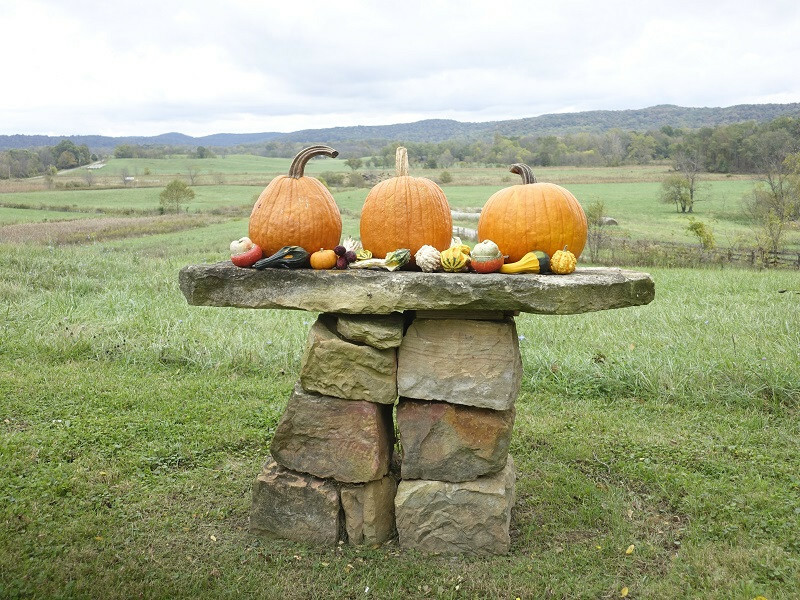 Irish-Americans, German-Americans, Mexican-Americans, and India-Indians gathered together in a remote corner of Appalachia to celebrate the growing and savoring of nutrient-dense food, on a beautiful landscape. It was a remarkable cultural event, unlike any we have experienced on this farm. 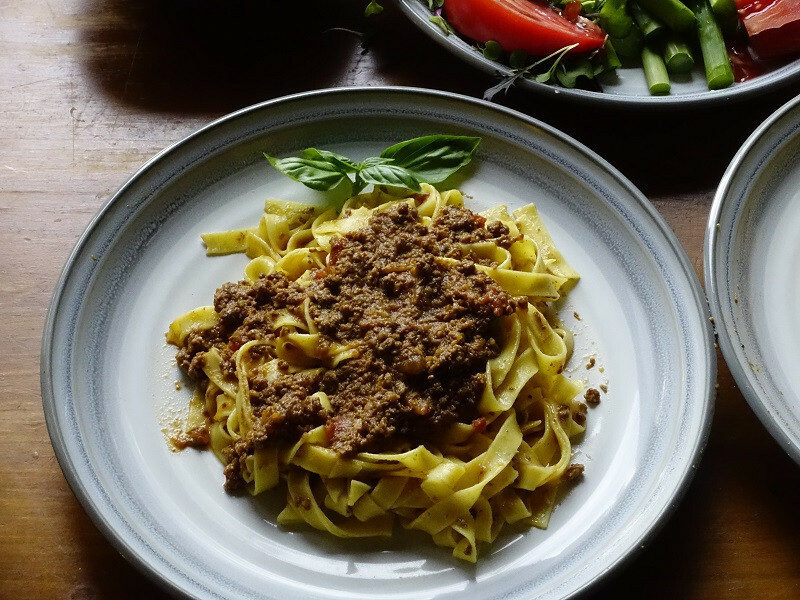 Many widely different perspectives quickly found unity over something essential - healthy food. Such convening seemed effortless, and was enriching and gratifying. FALL SPIRITS: THOUGH A HOT SEPTEMBER IS MAKING FOR MUTED COLORS IN OCTOBER, FALL SPIRITS ARE STILL IN THE AIR. We are celebrating the turning of the season with a farm tour this Saturday, consisting primarily of members of the Indian community in Cincinnati. 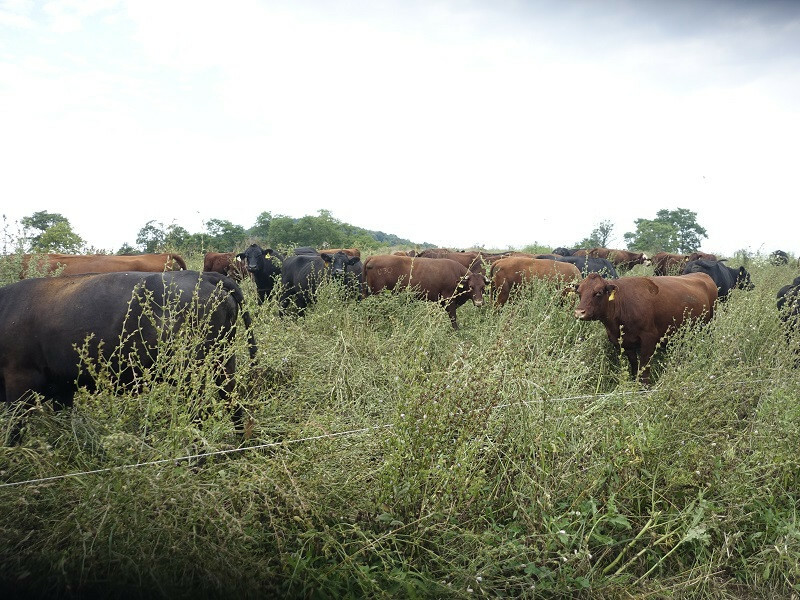 We didn't know any Indians before we started raising and selling grassfed meats. But now we do, and have fallen in love with them. That is yet another testimony to the power of nutritious food to create connections and build bridges. The spirit of food and the spirit of fall will be commingling this Saturday, to which we look forward. 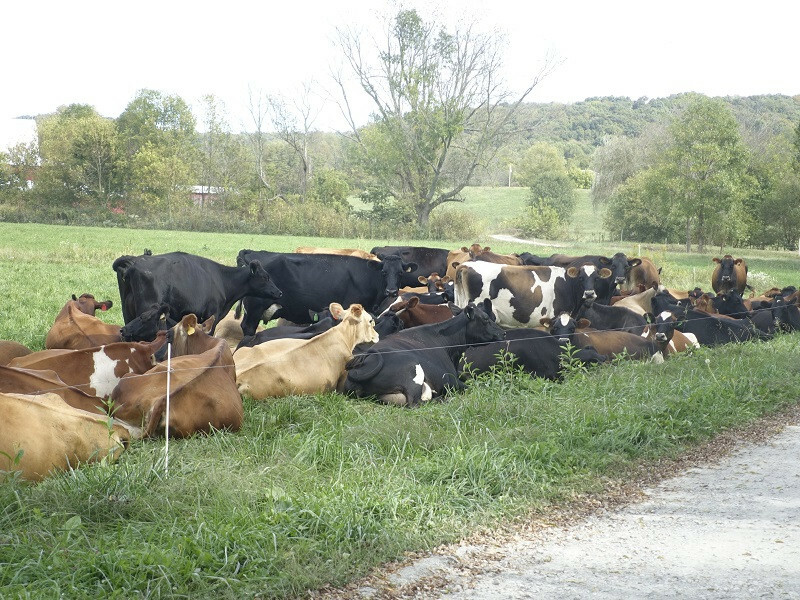 COMMON SENSE: THESE BEAUTIFUL DAIRY COWS DECIDED TO MOVE OUT OF THE SUN, INTO THE SHADE. That makes sense, when it is hot out. In like manner, when plumbing is leaking, we fix it; when livestock are on the road, we remove them; when a tire is flat, we repair it. These are significant matters calling for practical solutions, typical of life on the farm. They are no more complicated than matters particular to life in the city. Resolving them calls for measures of common sense. 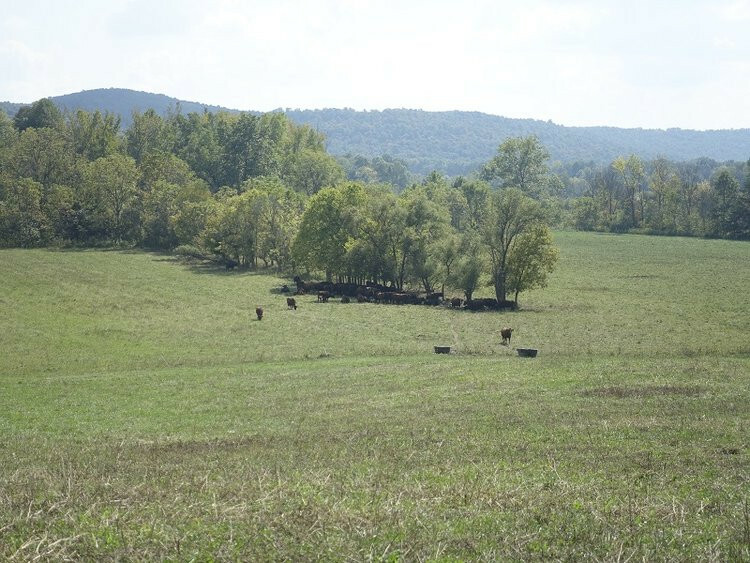 LYRICAL LYRA: OUR COWS AND THESE PASTURES ARE DEPENDENT ON THE SURROUNDING FOREST. The forest of the hillsides provides ecological stability and serves as a protective mantel for the valley below. Its roots prevent erosion of soil and store water during times of plenty to be released during times of scarcity. Mature trees release several hundred gallons of water a day into the ecosystem, for the benefit of its community, including nearby pastures. ANIMAL HUSBANDRY: CALVING SEASON IS UNDERWAY, AND SO IS OUR ANIMAL HUSBANDRY. The second of three cows to birth on Monday delivered twins. It took us about 24 hours to figure out the hiefer-calf was a twin and not a single. She appeared abandoned and gaunt, so we took her to the barn to begin feeding by hand. We debated what to do - whether to try to graft her onto one of Landis' dairy cows, as we have in the past, to feed her expensive milk formula for the next two months, or to put-her-down. Our experience with salvaging orphans has not been successful, all in all. We have tried numerous times with lambs, and they never thrive, and half of them die along the way. It is discouraging and expensive. Cattle don't have many twins fortunately, but we had two sets last year, both of which survived well. It took a day or so to figure out this calf was the twin of a small brown calf, as they looked identical, and the mother had simply decided not to pay attention to it. It probably went 24 hours without nursing. SOLES OF OUR FEET: WENDELL BERRY REMINDS US THE BEST FERTILIZER FOR LAND IS FOOTSTEPS. 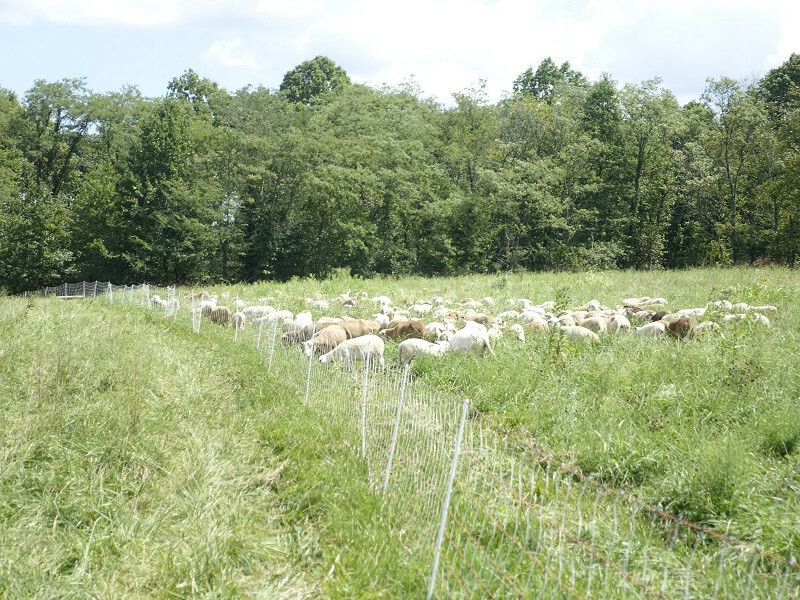 It takes a lot of footsteps to install these nets around our sheep, and move them every three days. Doing so keeps the guard-dogs in and coyotes out. It prevents sheep from "backgrazing" and infecting themselves with parasites. It keeps the flock on a constantly high plane of nutrition. And it produces the cleanest lamb imaginable - the Midwest's version of wild-caught fish. THE LONG ROAD: THE ROAD TO DIGNITY IS LONG. And so are the roads on our farm which need to be maintained! We probably have 4 miles of laneways to keep operable. The most important variable to effective roadways is drainage. Our farm is low-lying in many places, so drainage doesn't come naturally. 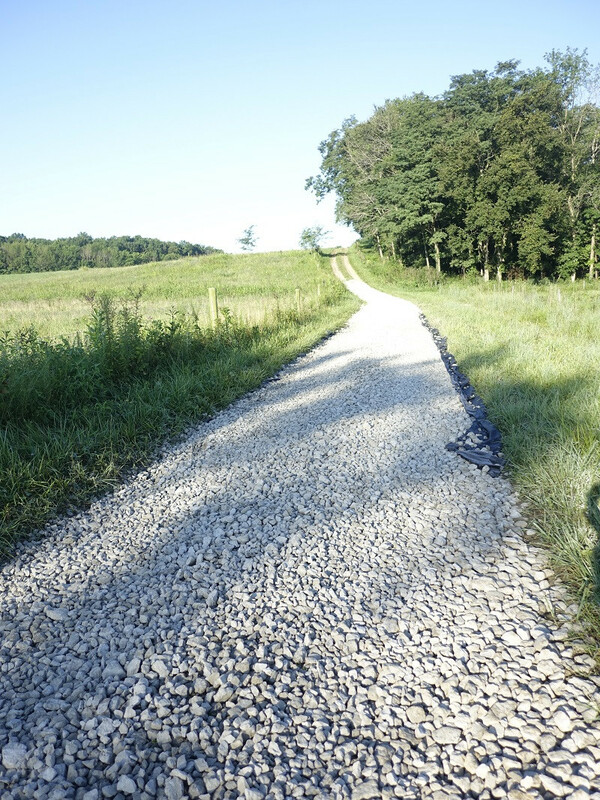 In spots such as this newly poured gravel, there is no drainage-ditch to access. Instead we put down "geotextile cloth" to support the gravel, which keeps it from continually disappearing into underlying mud. 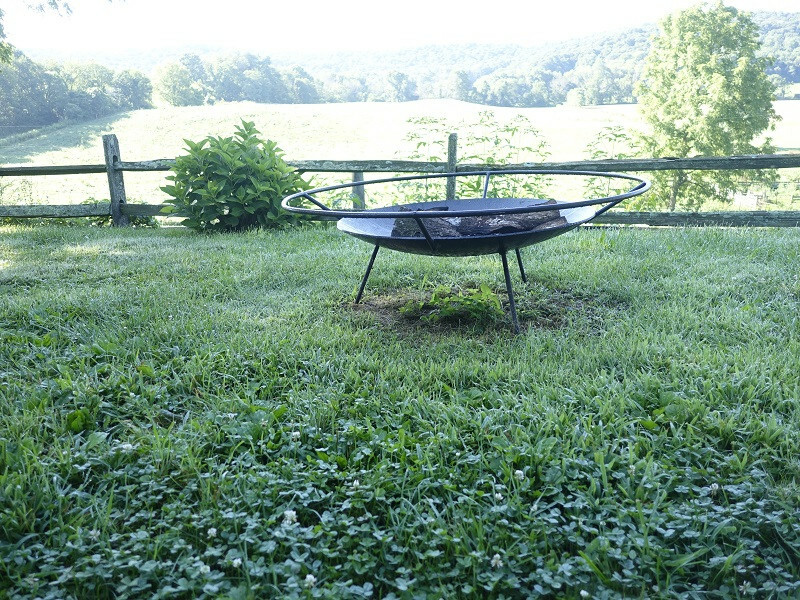 MAN OF STEEL: THIS FIREPIT WAS MADE BY JOCKO, WHOM THE GODS RECENTLY CLAIMED FOR THEIR OWN. Jocko worked with steel and was able to impart to it an uncommon lightness of being. That fire pit weighs close to 100 lbs, but it looks like it weighs no more than five. What grace and perfection it displays, as it dances in the air. Jocko had an eye for aesthetic and practical possibilities within basic elements. He could turn logs, stones, and sheets of metal into sensual artifacts of beauty. In that sense, he saw himself within the world of nature, where he found his inspiration. His most commercially known product was his mailbox, of which we have four at our farm. It is perhaps the perfect mailbox - simple, strong, balanced, and beautiful... And we have two of his fire pits. TALL GRASS: THE WET SPRING AND SUMMER HAVE CREATED AN EXPLOSION OF PASTURE. This field hasn't been grazed since April, so chicory and Queen Anne's Lace are in full expression, four to five feet tall. 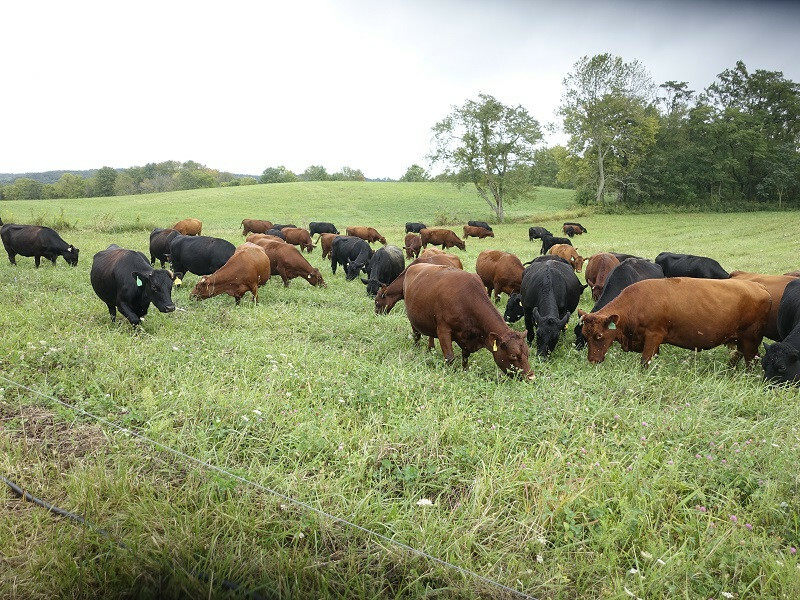 These plants are pretty mature by now, so cows don't pay much attention to them, but they are interested in the fescue, orchard grass, and clover closer to the ground. In pursuing their feed, they trample mature plants, creating a mat of mulch. This keeps soil moist and cool, and brings plant-matter in contact with soil to feed microbes within - perhaps the most important species on the farm. An active population of microbes is at the heart of creating organic matter. 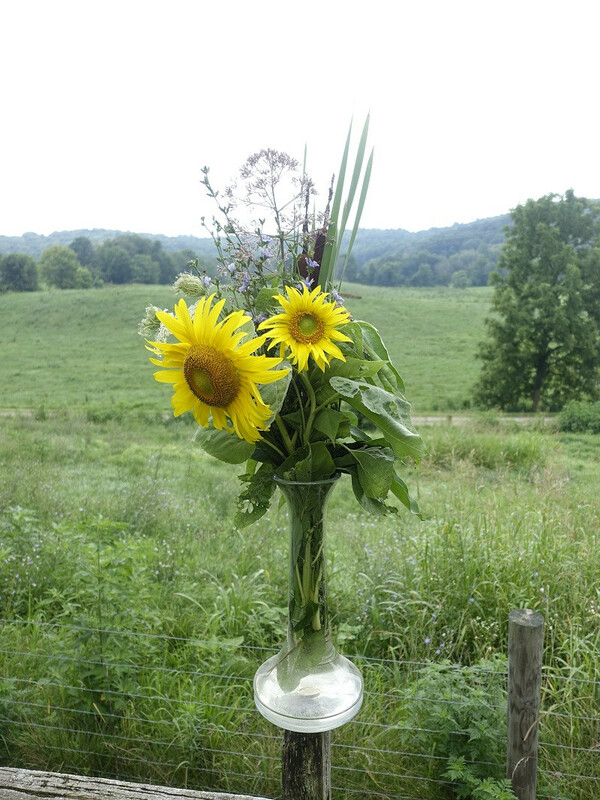 a bouquet of: milkweed, Joe Pye weed, chicory, cattails, Queen Anne's Lace, and sunflowers. In addition, we pay homage to her adopted birthday-flower - wild hibiscus, in the wetlands, which begins to bloom just at this time. 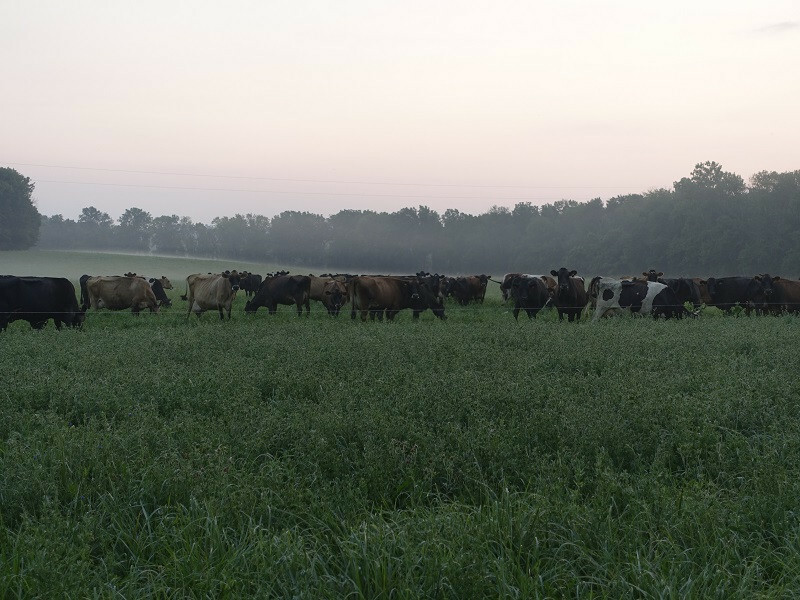 COOL OF THE DAWN: THESE DAIRY COWS ARE ENJOYING EARLY-MORNING GRAZING.